There are two raw co-op groups in the Bay Area, SFRaw and Fremont BARF Co-op. Because Fremont is across the toll bridge from us, I kind of only paid attention to SFRaw. However, they require a annual fee for members, which is a bit high for us since Maya doesn't need that much food, so I haven't joined them. They do have a freezer sale every week, but because I hate driving into San Francisco and they charge 15% more for non-members, I only been there twice. For whatever reason, a few weeks ago I decided to check out Fremont BARF Co-op, and to my surprise I found out they actually have a pick up location close to where we live. I placed an order last month, which was scheduled to be picked up this past Thursday. On Wednesday, the organizer sent out an email calling for volunteers to help on the pick-up day. Since I have some free time, I went to help out. It was a bit chaotic, but basically two full hours of moving, sorting and labeling meat. 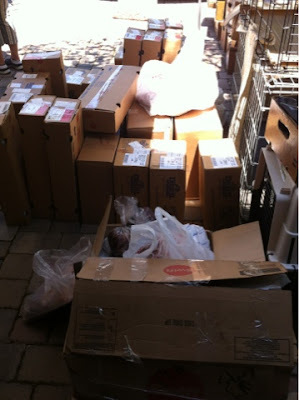 Here's a picture I snapped, which only shows about one third of the meat at the pick-up site. Unfortunately, the venders were out of stock on some stuff, so two out of the five items I ordered weren't available. I did bring home some duck feet, pork kidney and green tripe. I'm glad I was able to get some duck feet. I used to use chicken feet when Maya needs some extra bones, but since I stopped feeding chicken, I wasn't able to find anything as a replacement for a while. Maya's poop usually get mushy when I feed her a whole fish and I couldn't do much about it. Yesterday she got some duck feet to go with the fish, and today the poop came out perfect! As for the green tripe, I got the "Xkaliber" this time instead of the 100% tripe I got last time (both from greentripe.com). The Xkaliber is made of: Green Tripe, Muscle Meat, Heart, Tongue, Trachea, Gullet and Ground Bone. 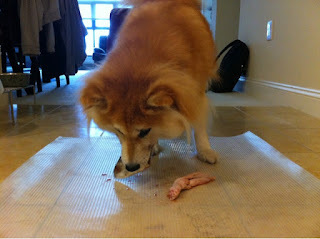 It still smells as bad, but I like the texture better as it has more chunky meat pieces. Since the percentage of tripe is a lower, I'll probably increase the amount I feed and cut out some other boneless meat. Overall, it's been a good experience. The people there were friendly and it's nice to meet other raw feeders. My only concern is that the products were placed outdoors for a quite a while before pick up. Though kept under the shade, with the hot weather, it could effect the freshness. At least I'll make sure to go pick up as early as I can in the future. Ooh, I'll have to check out this Fremont BARF group! Thanks for the tip!